Great white sharks are exceptionally large and live in most major oceans, in the coastal surface waters. They can reach lengths of more than 24 feet and are capable of weighing up to 6,000 pounds. 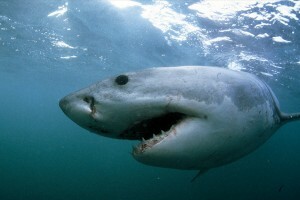 The great white shark is known to be the largest predatory fish in the world. Where does the largest predatory fish in the world eat? Wherever it wants! At 5:20 p.m. yesterday, a surfer off Leadbetter Point spotted a shark five feet away whose dorsal fin and tail fin were both out of the water. Judging by the reported 6′-7′ “spread” between the shark’s fins, plus its reported color and girth, this is being treated as a credible sighting of a great white shark. The City’s Waterfront and Parks and Recreation departments have posted warning signs at 14 locations near City beaches, and one on each of five lifeguard towers between Leadbetter Point and East Beach. 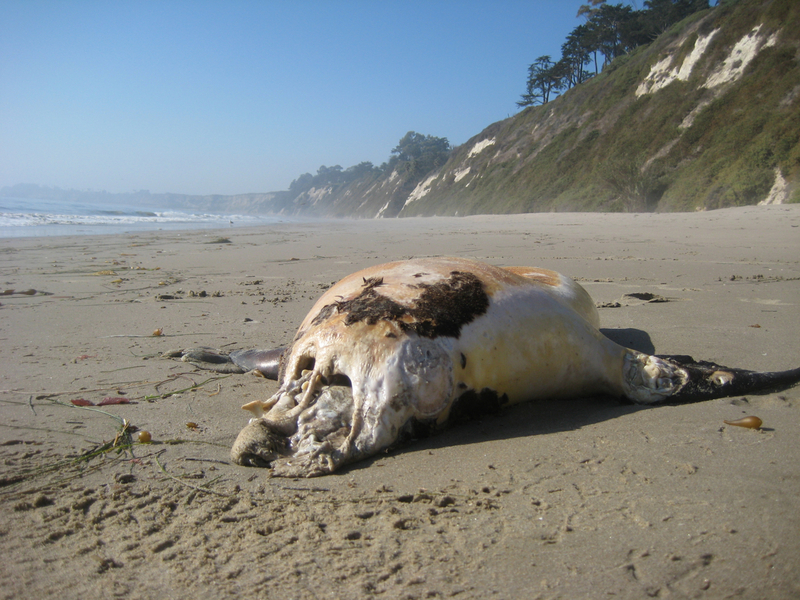 This action reflects standard protocols developed for this type of event and is warranted not only by yesterday’s sighting, but in light of recent, confirmed white-shark attacks on marine mammals in local waters. If there are no other shark sightings or evidence of shark attacks on marine life, the signs will be removed in 72 hours (Friday at sunset). Like other sharks, it is possible for great white sharks to have three thousand teeth at a time arranged in up to five rows. The front set of teeth usually does most of the biting and is considered to be the largest. In its lifetime, the great white shark can go through about twenty thousand teeth as it grows. The teeth of these sharks, like most sharks, will not run out. If one tooth is lost, another one will come forward from the coil-like reserve from their jaws. This tooth will spin forward and will replace the old one. There are also teeth at the back of the main rows of the largest ones. The teeth of these sharks are like cat’s claw since they are very retractable. They are not attached to the jaw and they move in place when the shark opens its jaws. 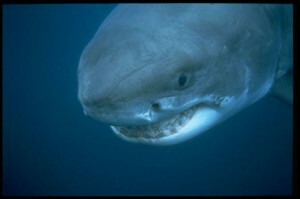 The teeth move on their own axis, outward as their jaws are being opened, moving inward when the shark closes its jaws. Because the teeth are associated to pressure and sensor sensing nerve cells, they possess highly palpable sensitivity. The diet of great white sharks comprise of small fish, dolphins, sea lions, seals, turtles, other sharks… and occasionally humans! They can consume up to several hundred pounds of flesh in one meal and they can go weeks even without eating because of their high metabolism and ability to maintain body temperature of about 14 degrees Celsius. Due to the fact that their teeth are so many and large, they are also called the janitors of the ocean. They can feed on various small animals and prey on the injured, sick and diseased creatures of the sea. They clean the sea up as they feeds their way through the surface of the ocean depths and so they are termed ocean janitors. These creatures are known as well for their acute sense of small and are known to smell even a single drop of blood in more than 25 gallons of water. They use their nostrils to smell and their gills to breathe, both highly advanced tools that support extreme predatory behavior. Decapitated Seal on Hope Ranch Beach… Great White Shark Victim? These creatures are mainly solitary but they are sometimes seen in pairs. The great white sharks have also been declared to be endangered species because of their decline in the number of sharks in 1970. At present, the teeth of great white sharks are found as jewelry for tourists. For so many years, people associate the great whites as a deadly predator and big threat to human life because of shark attack that is witnessed in real life and those shown in the television. These are the creatures of the sea may not be the typical big fish you want to put in your home aquarium.